In my running career, I’ve found there to be two types of runners: those who run in the mornings, and those who run in the afternoons. You can tell a lot about a person based on when they run. How organized are they? Are they high-strung, or more laid back? Do it right away, or get to it when get to it? Me? I’m a morning runner. I run in the morning for many reasons. Chief among them, I don’t trust myself to run in the afternoons. After a long, stressful day at work, the last thing I want to do is change my clothes and head out for a run. The couch just looks too inviting at that point. Secondly, in Memphis, the weather tends to be hotter than hell. Even in the mornings it’s pretty bad, with high humidity and dew points. This morning, I went for a seven mile run before work. It was 80 degrees with a dew point of 76. I was soaking wet before I had gone a mile. It wasn’t running, it was swimming. Running in the mornings gives a bit of a break from that heat. If I wait until after work, it could be 95 with a heat index of 110. No thank you. Want more reasons? How about not having to take two showers? You save water and energy. How about not missing out on happy hours or impromptu dinners? Your afternoon is free to do as you please. Just don’t stay out too late, otherwise you may sleep through your alarm. How about just getting it done and over with. If you run in the morning, before any other obligations or surprises come up, it’s done with. You may need to stay at work late, or get stuck in traffic. There are too many ways to have to miss your run. 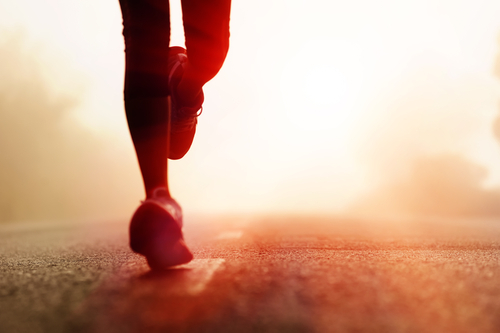 Better diet and a stronger metabolism also come with morning running. Don’t believe me? Just check out this article from US News and World Reports. So what does this say about me? It says that I need to accomplish it early, or else I’ll get side tracked. In that sense, I’m both organized and a high risk to get distracted. It says I’m susceptible to poor runs in the heat, which if you’ve seen my workout from last week, you know is true. And it says I value my evenings more than an extra hour or so of sleep. Nothing against afternoon runners, of course. I’m of the belief that if you’re doing any sort of exercise, trying to live a healthy lifestyle, then good for you. Find what works for you and stick with it. I do other workouts in the afternoon (spinning, lifting, yoga, etc. ), I just have a hard time running after work. Not that I haven’t done it, or won’t do it. When it stays dark early, I usually switch to afternoon runs for a bit. But now, during the summer, oh hell yeah. Wake up, go for a run, and you know your day will be great. To me, these are not “impossible” goals. These aren’t even goals, really. Rather, they are guiding principles for life. A goal should be measurable and actionable. Go here to learn about SMART goals. Of the five goals the author brings up, only two (#4 and #5) are measurable in any realistic sense. You can’t prove #1; are you going to survey every single person that you have ever tangentially associated with to verify that you made them happy? You can only measure #3 after you are dead. Guiding principles are things we should always be going after, using them to dictate how we act in life. We should never give up on them. As far as the two measurable goals, I don’t have a problem with them. I personally have used #5 to set some deadlines to spur myself into action. Without that deadline, I wouldn’t have signed up for a race. This only works for some goals; don’t set an age deadline on something like marriage or you’re likely to make a bad decision to accomplish it. That gets to my second criticism. The author, Noah St. John, says that you should stop going after those goals immediately. Why? Shouldn’t these be exactly the sort of goals that we go after in our lives? Shouldn’t we want to make people happy? To try and not make mistakes? To not fail? To me, these are EXACTLY the types of goals that can lead to a successful life. Looks much better, doesn’t it? Striving to make people happy is a great principle to follow in life. Striving not to fail seems like such a no brainer; who sets out to fail? You will fail in life, for sure…that’s unavoidable. But you can seek to limit your failures by planning ahead and making smart decisions. Again, seems like a good way to live a life to me. If you’re in sales, shouldn’t you strive to close every sale that comes up? If I had a sales staff, I certainly would want them to do that. A job interview is selling yourself to the hiring manager. Shouldn’t you strive to always successfully sell yourself in that instance? I’ve never gone on a job interview where I didn’t! Always be aware of absolutes like the first version of these goals. In fact, always be weary when someone tells you not to have a certain goal. It’s dangerous, pessimistic and limits character growth. The “goals” in the article are not even goals, but guiding principles in life that are actually a GOOD thing to push for. Once again, weather dictates everything when it comes to my training for the 2014 NYC Marathon. I knew this week would be an issue due to the volume I was looking at. In addition to my normal mileage, I had a 5k on Sunday to do (more on that later). Normally I’d try to combine my long run with the race, but with a 14 mile long run and a 3.1 mile race, it just didn’t fit. This meant I was looking at a pretty decent jump in mileage from last week, going from 25 to 31. Not ideal, but I managed it ok. With that, let’s get to the recap! Monday. Cross training on my bike. I woke up a bit later than I would have liked, so I only spent 30 minutes. I kept a decent cadence the whole time, averaging 18MPH. I know, I know. Speed on a trainer means nothing. But I felt it was a good effort, and I need to get used to spinning faster in order to improve my bike fitness. I have big goals, and the bike is a key component of that. I really need to ride more! Tuesday. My 4 mile run at 10k pace. If you look at last week, you can see I ran this more than a minute faster. It’s all due to the weather. Low humidity and temps in the 60s sure is better than high humidity and hot. This distance will get picked up shortly, as I’ve been running 4 miles at this pace for quite awhile. Wednesday. A jump up in distance on my medium-distance run, up to 7 miles. This is done at half marathon pace, roughly 9/mile. It felt really good and I could have kept going. Again, the weather REALLY matters during these runs. Thursday. 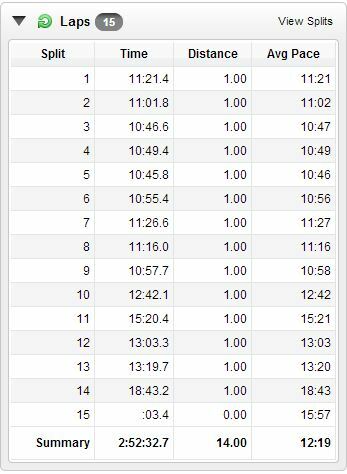 Normally, this would be my speed workout, but with my 5k on Sunday I decided to take it very easy. Just a quick, easy effort for three miles. Saturday. Friday night, we – along with the entirety of downtown Memphis – lost power due to an underground explosion. There were reports of manhole covers blowing up into the air. It went out around 8:30 and the temperatures quickly climbed in our apartment. At 11:30, I got a call from a friend who was locked out. At 12:30, R got a call from some friends who were lost in the building looking for the stairs. At 2AM, the power came back on and woke us up. At 4:30AM on Saturday, our alarms went off and it was time to knock out 14 miles. Not exactly an ideal start, eh? But surprisingly, I felt pretty strong. 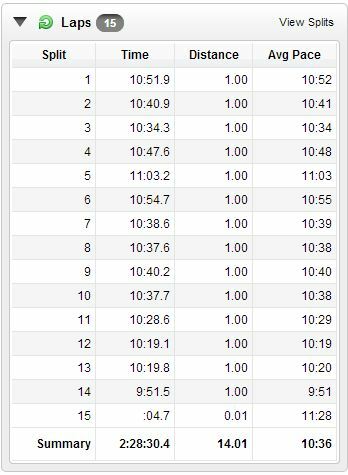 I kept the pace nice and easy during the first half, then picked it up in the last few miles and ended up with a decent negative split. After that, we rested for a bit then headed over to pick up our packets for the next day’s race. We stopped at the new taco place and devoured three orders of the little guys: puller pork, steak tips and pork belly. They were friggin’ delicious. The rest of the day was spent on the couch resting up and rehydrating. It was getting hot and humid, and we knew the race would be interesting. Sunday. The 5th annual Breakaway-Bardog 5k, a race to support St. Jude and part of the Bardog anniversary party. It’s always a fun race with the best postrace party ever. I had set two PRs the first two years I ran it (24:34 is still my best); last year, I had run a half marathon the day before so I wasn’t at my best. This year, I knew it would be hard to set a PR, but I went out as best I could. I ended up with a 25:48, good for 24th/81 in my AG and 180/1042 overall. I’ll take it, given the circumstances. It was a sauna out there! Afterwards we enjoyed catching up some with some friends, a few refreshing beers and some sliders. We called it a day and headed home, forgoing the rest of the alley party. A fun weekend filled with running stuff. The heat is returning again this week, coming back with a vengeance. High 90s, heat indices over 100 and high humidity. This should be fun.